lan Spangler reports on the launch of Etihad Stadium’s new ‘Intimate Mode’, which will allow this 60,000+ capacity venue to host smaller sized events in an intimate atmosphere and thereby add to its revenue stream. Etihad Stadium is a multipurpose venue that hosts some 85 sports and entertainment events per year. The major hirer is the AFL, which on average schedules 50-55 matches per year. Furthermore, the stadium hosts domestic and international soccer events, rugby matches [Union and League], as well as concerts and entertainment events with the ability to have 60,000 plus patrons. Pictured: AC/DC in concert. As Etihad Stadium celebrates reaching the milestone of 25 million patrons, it has chosen a powerful way to expand its market presence with an exciting new offering: Intimate Mode. 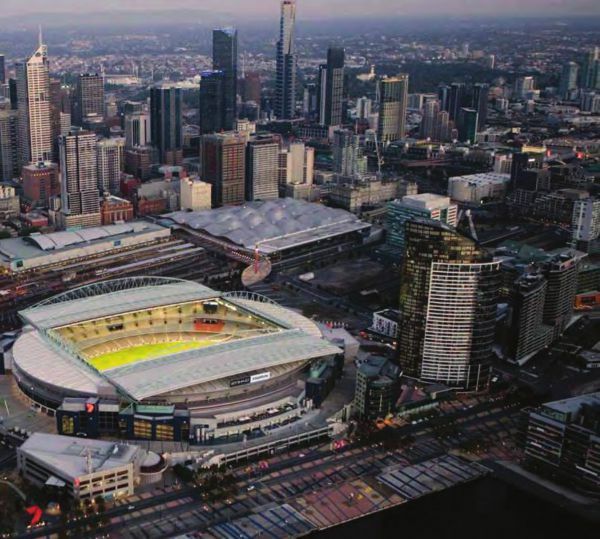 Over eleven years, Etihad Stadium has established itself as a premier Australian sports and entertainment venue. The facility’s state of the art facilities, including its famous retractable roof, have helped accommodate the 25 million patrons since it officially opened in March 2000. Fans flock to events, whether it’s Australian Rules Football (AFL), other football codes such as A-League Soccer, Rugby League (NRL) and Rugby Union (ARU), or some of the major headline entertainment acts that have found their way to the Docklands landmark. A record 54,444 watched St Kilda beat Geelong on July 5, 2009, which still stands as a record for an AFL match at Etihad Stadium. And in February 2010, over six nights, 185,000 patrons attended three separate AC/DC Concerts. Even its naming rights partnership with the prominent Middle Eastern based airline, Etihad Airways, helps to give the venue an international feel. ”We are different and we are proud to be different,“ is the mantra of long serving CEO, Ian Collins AM. The stadium is vastly busier than most Australian sports stadia or many of those overseas for that matter. In 2010, Etihad Stadium hosted a record 86 arena events plus 600 functions in its many and varied entertainment spaces. When it is considered that some prominent stadia host only 30-40 arena events a year, it is a commendable work load. Next summer, the stadium will attract the focus of the cricket world, when it accommodates the Melbourne Renegades; one of two Melbourne teams recently announced to make up Cricket Australia's Twenty/20 Big Bash. Now the team at Etihad Stadium is set to embark on something different again. 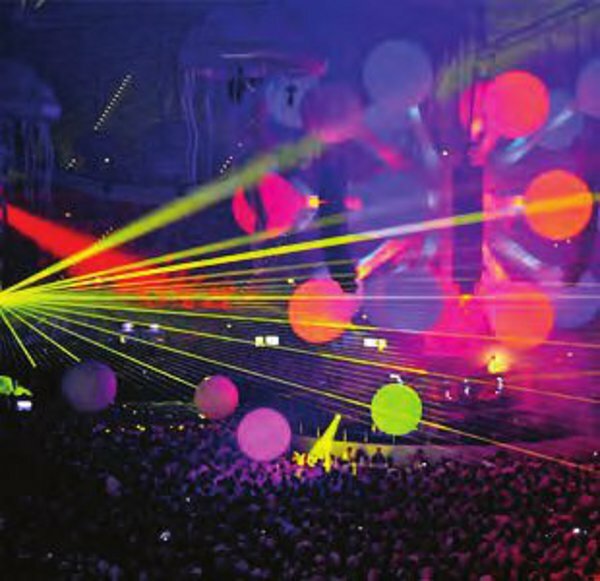 In a bid to try and capture some of the smaller to medium sized entertainment events that are part of the entertainment and business events landscape, the stadium has now showcased a new ’Intimate Mode‘. ”We coordinated a presentation to prominent figures in the national entertainment industry, giving them an opportunity to overview what we have done. The feedback is that they were impressed with what they witnessed,“confirmed Collins. Production Resource Group: the key player for the drapes‘ design and installation, including their capacity to be rolled on and off the arerna. The design also enables the drapes to be unfurled within in a matter of minutes.In addition, they supplied the lighting and audio visual equipment for the launch. Etihad Stadium Launch of ’Intimate Mode’: the innovative space is created by 20m-high and 180m-wide drapes being hung from the stadiums roof. Intimate Mode utilises the arena as well as seating on all three levels, making it an ideal space for a range of functions like concerts, conventions, product launches, or gala dinners. ”Etihad Stadium has a proven track record of hosting large arena events, such as AFL and international sport, as well as major arena concerts and events for up to 70,000 patrons. The new Intimate Mode will allow us to cater to a different market and provide an opportunity for events of any size. The stadium has always had the capacity to do things differently due to our retractable roof, which allows events to go on without any interruption. We see Intimate Mode as another innovation that will allow Etihad Stadium to stand out from the crowd... - lan Collins AM, CEO, Etihad Stadium. Etihad Stadium is privately owned and is required to generate a financial return for its more than two million superannuants who have a vested interest in the venue. Therefore the facility has a need to continue with a complete fixture of sport and entertainment events throughout each year, including concerts, which can lead to turf stress. This may necessitate a balanced turf replacement program, depending on the type of events staged, the number of events hosted, and the length of time the roof is closed, which causes a lack of natural light. Etihad Stadium is a multipurpose venue that hosts some 85 sports and entertainment events per year. The major hirer is the Australian Football League (AFL), which on average schedules 50-55 matches per year, including NAB Cup (the pre-season Competition) games and the occasional final. Furthermore, the stadium hosts domestic and international soccer events; rugby matches (Union and League); as well as concerts and entertainment events with the ability to have 60,000 plus patrons. In 2010, Etihad Stadium had 49 AFL matches and eight NAB Cup pre-season matches, which included the Grand Final. On top of that, the venue hosted nine Hyundai A-League matches, three games as part of the Asian Champions League (soccer), a Bledisloe Cup rugby union test match (Australia v New Zealand), three NRL games, two international soccer friendlies, and the annual EJ Whitten Legends Game.The venue also hosted many entertainment events in 2010, including the Sensation dance event on New Year’s Eve, three AC/DC concerts in February, a George Michael performance in early March, as well as sell-out Bon Jovi and U2 concerts in December 2010.This regular events schedule provides a sound base to secure high value commercial programs and partners: sponsorship (including naming rights), advertising, extensive membership programs, and loyal patrons who are served by an array of quality venue service suppliers. Etihad Stadium is widely known for its unique retractable roof- the largest of its kind in the Southern Hemisphere. Furthermore, Etihad Stadium is the only AFL venue with a roof, which provides dry conditions for patrons and players at all times. The roof takes eight minutes to open or close. Etihad Stadium provides a natural turf playing surface with a total area of 19,000m2. Currently, the arena is made up of 17,600m2 of natural turf and 1,400m2 of synthetic turf, which runs the entire perimeter. For an AFL match, the boundary line is 5m from the fence line. The synthetic turf is 3m wide and situated outside the playing area. 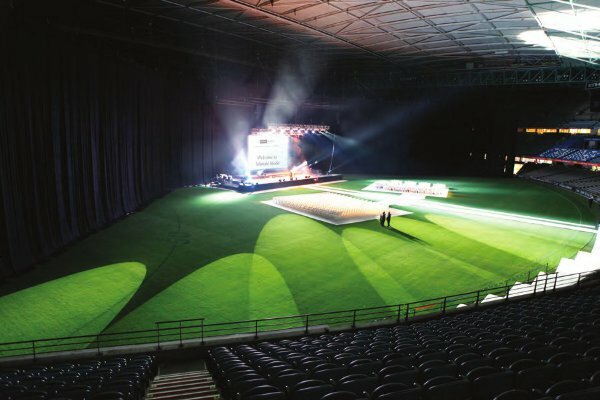 The venue is committed to investigating the world’s leading technologies and regularly visits stadia and turf industry experts around the globe.Through this research the venue decided to introduce ’grow lighting’ by Stadium Grow Lighting (SGL), which is now also used by the MCG, AAMI Park and ANZ Stadium. Etihad Stadium was the first venue in Australia to introduce 'grow lighting'. The Melbourne Stadiums Limited Board of Directors approved the $2.5m expenditure in 2007, enabling the purchase and transportation of seventeen lighting rigs, which arrived at the stadium in January 2008 from the Netherlands. The decision to purchase the lighting rigs was only made after in depth international research undertaken by members of the stadium’s senior executive. The lights, which simulate sunlight and generate warmth, had been in use in Europe and the UK where cloudier colder and grey conditions exist.These ’grow light’ rigs are used by many of the world’s best known stadia, including Emirates Stadium, Lambeau Field, Allianz Arena, Soccer City, and Wembley Stadium. 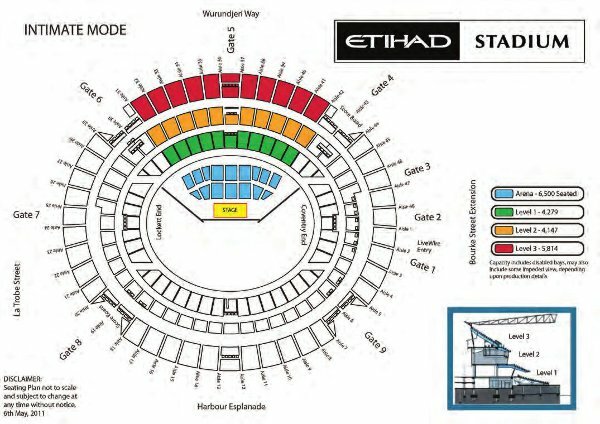 The initial research of the lights viability at Etihad Stadium needed to consider the enclosed nature of the venue, as well as significant shade patterns. Due to their eventual success, the venue’s Arena Management team has successfully been able to cultivate grass during what are traditionally non-growing periods i.e. winter. Etihad Stadium's commitment to leading edge technology included worldwide investigation and regular visits to other leading stadia around the globe to establish the very best options available. This led to their adoption of Terraplas plc’s Terraflor and Terratrak Plus. 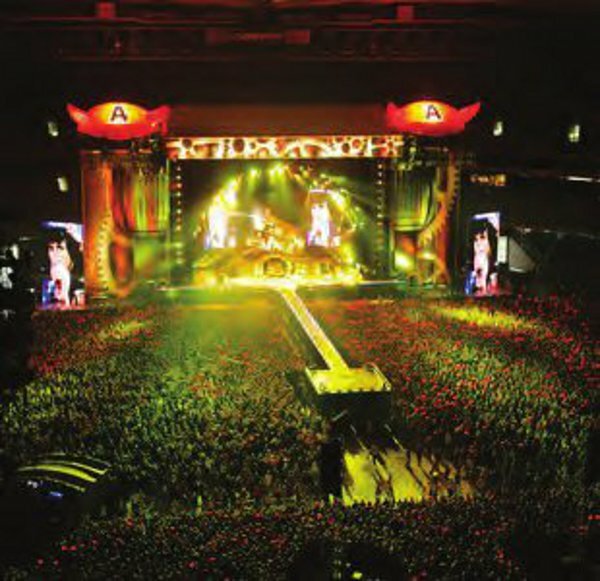 Terraflor is the latest-generation in turf protection, enabling the staging of major rock concerts or matches within hours of each other. It allows the passage of air and light but not liquids, and provides a moisture canopy to maintain grass health when covered, while also performing to the highest public safety standards. Terraflor was an ideal match for Etihad Stadium as it is designed to protect both natural and artificial turf. Terratrak Plus is a recent addition to the Terraplas range of proven turf protection products. Applying the latest in computer aided design and testing to create a product that meets the challenges and requirements of the event industry, it is the culmination of over twenty years experience in the temporary roadway and flooring industries.Terratrak Plus is designed to take the weight and stresses exerted by forklifts and 100 ton cranes used in the concert business. It is light enough to be put in position by hand and with its overlapping design and unique locking system it creates a continuous surface, free from gaps and other potential trip hazards. A unique feature of Terratrak Plus is that like all other Terraplas plc products it allows the passage of light, to keep the grass green. No other temporary roadway has this feature, which is one of the reasons why Terratrak Plus is rapidly taking over this market and is now the choice of roadway for many groundsmen. As an environmentally responsible venue, the arena is predominantly irrigated by rain water harvested from the stadium’s retractable roof. In 2008, seventeen large water tanks were installed, which have a capacity to store up to one million litres of rainwater and had in fact harvested 17.8 million litres within two years. In addition, water collected off the roof is used for flushing the toilets on Levels 1 and 2 of the stadium on event days, and for the washing of equipment. It has been the combination of secure and successful private ownership, an enviable event delivery track record, diverse contracted programs of annual events and high value commercial program and partners, a retractable roof for assured event delivery, the world’s best-practice turf management, and associated progressive environmental programs, which has provided the solid foundation from which Etihad Stadium has been able to successfully launch the Intimate Mode. Etihad Stadium will always be in the running to host major entertainment events, such as big concerts, because of its capacity and location. The venue’s roof, which provides comfort to patrons and artists alike, makes it a favourite amongst promoters. However, with the busy schedule of arena events, big headline acts such as U2 or Andre Rieu require a significant commitment in terms of the bump-in and bump-out schedules. Intimate mode will accommodate smaller events, which means the likelihood of less ’traffic‘ per event on the arena and the overall transition from the build of an event through to its conclusion will be significantly more efficient. The innovative space is created by 20m-high and 180m wide drapes being hung from the stadium’s roof - creating a unique, spectacular, and affordable function space, modelled on the very best of the draping, staging and flooring designs in Europe and North America. Intimate Mode utilises the arena as well as seating on all three levels, making it an ideal space for a range of functions like concerts, conventions, product launches, or gala dinners. An infrastructure has been constructed that enables the bump-in and bump-out to occur in only minutes. The drapes have been constructed on rollers, which can be easily wheeled onto and off the arena. Through the use of a remote control, the drapes can also be hoisted and lowered from the roof, taking only a matter of minutes to set into place. In 2010, Etihad Stadium hosted many large-scale entertainment events, including the Sensation dance event on New Year’s Eve, three AC/DC concerts in February, a George Michael performance in early March, as well as sell-out Bon Jovi and U2 concerts in December 2010. 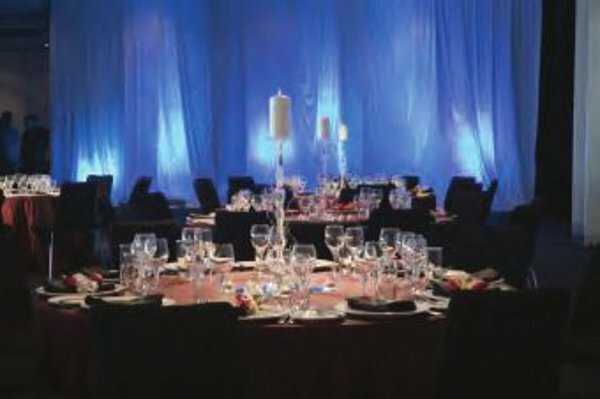 In ’Intimate Mode’ the venue can cater to conventions, concerts, and gala dinners. The new mode has the potential to attract different audiences to Etihad Stadium and widen the appeal of the venue. More events, through a greater diversity and different categories of events, expands the revenue base of the facility, strengthening the value of the business to shareholders and introducing new stakeholders, such as new promoters, as new events are conducted at the venue. These new events potentially generate increased employment opportunities, initially in terms of extra casual and contract employment, but with the expansion and consolidation of events, it may require additional full time employment as well. It provides possible scope for service and equipment suppliers, as well as businesses across related industries such as catering, merchandising, ticketing, security, car parking, event promotion, marketing and media. These events create better skill development and progressively increase staff training opportunities, as the number and variety of events emerge. Increased revenue can result from increased advertising and sponsorship, together with potentially higher returns from corporate suites, as well as the various club memberships; Medallion, Axcess One, and Diamond. Ultimately, the venue develops the capacity to sustain a higher level of performance with the expectation of further innovation beyond the Intimate Mode. "The stadium has always had the capacity to do things differently due to our retractable roof, which allows events to go on without any interruption. We see Intimate Mode as another innovation that will allow Etihad Stadium to stand out from the crowd?" Promoter Andrew McManus commented: ”This is a venue within a venue. It is intimate for a big rock show, but you are not playing to a monstrous big barn. “Just as Etihad Stadium was the catalyst for the 21st century development of the Melbourne Docklands, it has now provided the catalyst for the second decade of its own development. Acknowledgement: Special thanks to Bill Lane, Com- munications Manager, Etihad Stadium for his valuable assistance and approval for the use and supply of photographs and associated documentation. ”This is a venue within a venue. It is intimate for a big rock show, but you are not playing to a monstrous big barn...“ -Andrew McManus, Promoter.